Rosacea is a skin disease that causes pimples and redness on your cheeks, nose, forehead, and chin. Redness may occur in intermittent intervals. Some people term rosacea as “adult acne” because of its outbreaks that appear like acne. This disease may also cause soreness and burning in the eyes and eyelids. Symptoms may worsen if the disease is left untreated. Scientists have not been able to determine the exact causes of rosacea. People who have fair skin and blush easily seem to be more commonly affected by this disease. It may also run in families of some patients. Alcohol abuse does not cause rosacea, but alcohol consumption may result in worsening or flaring up of the symptoms. Symptoms of rosacea usually flare up when something causes the facial blood vessels to expand, which leads to redness. Some of the common triggers leading to this condition are hot weather, exposure to sun and wind, exercise, stress, alcohol, spicy foods, and hot baths. Sudden temperature swings from cold to hot and hot to cold may also cause a flare-up. Bumps or pimples on and around the cheeks, mouth, nose and forehead, and a flushed face are the common symptoms. Flushing or redness of the face may last for several days at a stretch. Facial skin may show up thin red veins that appear like spider webs. The patient may experience a stinging or burning sensation, particularly when a medication or lotion is applied to the skin. Face appears increasingly dry, sunburned, and sensitive. Some patients may also suffer from red, dry, and irritated eyes. The eyelids may appear swollen and red, and the vision may become slightly blurred. Eye problems may worse if rosacea is not treated on time. 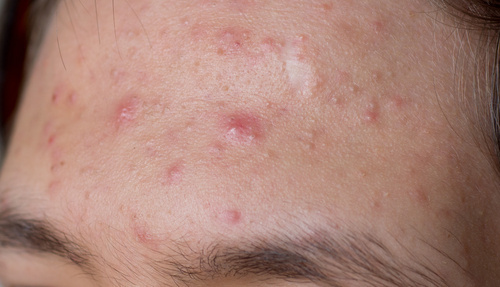 In absence of early intervention, the facial skin may develop knobby bumps, which can multiply. This is an advanced condition known as rhinophyma. In rare cases, it may give the nose a waxy, swollen look. The dermatologist may prescribe antibiotic pills or cream to treat the early symptoms such as pimples and redness. Antibiotic pills may also be prescribed to treat eye problems caused by rosacea. It may take about a month before the symptoms will reduce, and stronger medications may have to be used if antibiotics fail to control the problem. Advanced cases of rosacea may have to be treated with laser surgery, cryosurgery, or dermabrasionfor an effective outcome.